The Prayer Shawl Ministry is intended to reach out to those in need of comfort and solace, as well as in celebration and joy, through the giving of prayer shawls. crocheting into a prayerful ministry and spiritual practice. The shawl maker begins with prayers and blessings for the recipient. The intentions are continued throughout the creation of the shawl. Upon completion, a final blessing is offered before the shawl is sent on its way. 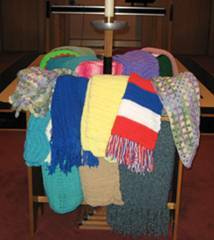 Here at St. Paul’s, our prayer shawl ministry is growing. We had our first blessing of shawls in April 2008, and a second blessing was held in August. We recently expanded our prayer shawl ministry as an outreach to people outside of our congregation. 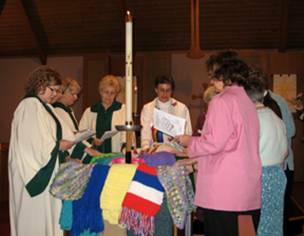 Congregation members have requested prayer shawls for friends and/or family in need of comfort, or who have celebrated a birth or marriage. As of August 24, 16 prayer shawls have been distributed through our ministry. Currently we have 14 people involved in making prayer shawls, and would love to see more. If you do not know how to knit or crochet, we would be happy to teach you! If you are interested in helping in the Prayer Shawl Ministry, please contact Peggy Kern or Martha Lindenmuth.